For stretching BARBED WIRE fencing. 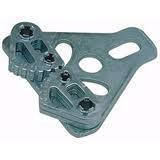 Must be used along with a come-a-long or other tensioning device. * Please call us for any questions on our fence stretcher barb wire rentals in Tualatin and Eugene, serving the Portland Metro area, Eugene/Springfield Metro area, Oregon, and SW Washington.